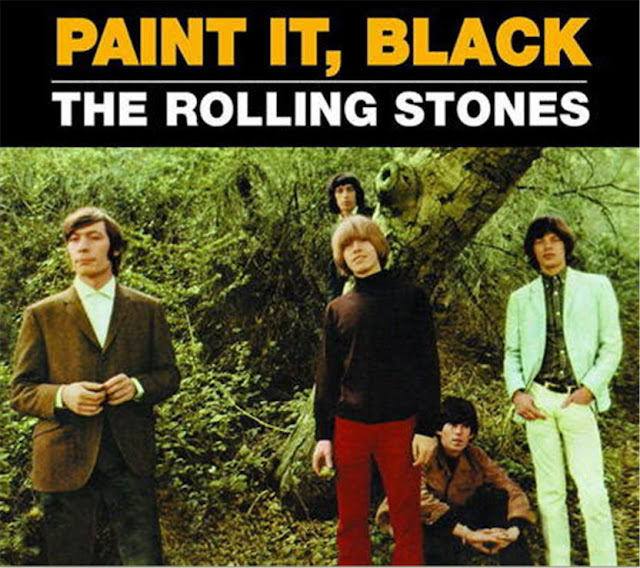 Could I have been the only one who didn’t realize that the name of the Rolling Stones song was correctly written as “Paint It, Black” — with a comma? And doesn’t that one stray mark radically change how you read the title? Just go ahead and try to arrive at a sensible reason why the title would be punctuated this way. According to a 2003 book on the band, Keith Richards says that the record label, Decca, put the comma there erroneously, so my reaction is “Did they actually listen to the song?” But then I realize that the phrase “paint it black” is never actually spoken in the song. It’s always “painted black” — “I see a red door and I want it painted black” instead of “and I want to paint it black.” In any case, the Rolling Stones’ official website has yanked the offending comma, but isn’t it surprising that it was allowed to linger at all, given that Aftermath debuted in 1966 and even non-Americans would have been aware of the growing civil rights movement? Oh, I love stuff like this. Why on earth did someone at Decca decide to put that comma in there? Did he/she think, "Oh, those idiotic Rolling Stones, they never did know their punctuation," before gleefully adding it to the cover? I'll bet that's not far from the truth. It's like how store owners, etc., like to add apostrophes to window signs. You know, CD's, DVD's, that sort of thing. I often want to go into these establishments and ask them, "Why did you add in that apostrophe? What was the reason?" Because, really, if you think about it for a second or two, there is no reason to do such a thing. No. It's really baffling. I mean, it's no more logical that we make most plurals just by adding "s" -- and now that I think about it, I have no idea why that letter became the pluralizer -- but the instances in which people would use an apostrophe to make a plural are so few that it seems strange that the "grocer's apostrophe" would be so prevalent. You actually spent time and thought to write this.....incredible. Isn't there something more socially conscious to add to this otherwise good site? I'm all about overthinking unimportant details. That's kind of what I do here. Wow, that anonymous commenter is lame in an outstanding way. I LOVED this post, and I share your bewilderment at that comma. Hey, he did say that I have an "otherwise good website." That's worth something. Using an apostrophe to pluralize acronyms is standard, according to some sources like Merriam-Webster's Dictionary of English Usage and The Oxford Companion to the English Language. It's not as common as pluralization without an apostrophe, but it's still ok. Although I often forget this fact, you're right, per usual, Goofy. Question: Any notion how it came to be that an "s," with or without an apostrophe, ever came to symbolize plurality? As anonymous says, the plural "s" goes back to Old English, and before that back to Proto-Indo-European, where "*-s" was used to mark the plural. It was found in the nominative plural ending "*-es" and the accusative ending "*-ns". So the "-s" found in the plural declensions of some Latin and Greek nouns is related. I believe we imported the plural S from French via the Normans. Prior to that our Germanic roots did it the way that language does, typically "-en", the only remaining examples of which I can think of are "oxen" and of course "children" ("women" I think took a different route). As for the apostrophe, there is no form of correct English that pluralizes using it, at all. The New York Times AFAIK still persists in using it on decades (e.g. "the 1980's [sic]) but they're in error. -s for plurals just part of the English language, as it is in many other languages that descended from proto-Indo-European. Old English singular plural possessives were most often in the form -es, while plural genitives in that form ended in -esa, but as English lost most of its inflections, people stopped pronouncing them. that's why you "abbreviate" singular plurals by replacing the unpronounced "e" with an apostrophe ("the swan's throat") while in the plural form, the apostrophe replaces the missing final -a ("the swans' throats"). And that's why using the terminal apostrophe to indicate possession on singular nouns that happen to end in -s is a mistake. It's easy to see how people make this mistake, as it seems like an arbitrary rule until you know the history. Which history, moreover, is never taught and hardly known by anyone who teaches grammar. As goofy points out, using apostrophes in plurals of acronyms is common not thought to be wrong: in fact, until it was forbidden by the 10th Century grammarians, there was a tradition of using an apostrophe-s with strange or borrowed words, though, evidently, never with proper English words. I don't think the possessive apostrophe was used to replace the missing final "-a". The possessive apostrophe was first used in the 16th century, and by then English had long lost that inflection. Anyway, "-esa" was not a noun ending in Old English as far as I know. The plural possessive apostrophe, as in "the swans' throats" was established in the middle of the 19th century. As far as I can see, this apostrophe isn't standing in for anything. oops: that should obviously be "19th century grammarians" not "10th"! Today it would be more correct to write "Paint it, African-American"
Perhaps it's indicative of today's hypersensitive PC culture that "Paint It, Black" -- with the superfluous comma -- would be construed as racially offensive. For all we know, the singer could be addressing a painter whose name happens to be Black. The cover of the Mamas and the Papas' first album had their name printed as "The Mama's and the Papa's", with unnecessary apostrophes. And Bobbie Gentry's classic "Ode to Billy Joe" is still frequently misspelled as 'Ode to Billie Joe," thanks to a record label screwup. Billie is usually a girl's name. Then there's the 1982 hit "Come On Eileen" by Dexys Midnight Runners. That song title desperately needs a comma after the word "on". As written, it has a completely unintended meaning. LOL, good point on the last. No one however suggested the form "Paint It, Black" was "racially offensive". There can be nothing "offensive" about a simple neutral descriptor containing no value judgment.